The refurbished TRIMDON STATION COMMUNITY CENTRE was officially reopened on Saturday when one of the local councillors for the ward, JOAN FREAK, cut a “ribbon” ( in fact 10 feet of Police Crime Scene Tape). Having been officially welcomed by Chairman of the Deaf Hill Ward Regeneration Partnership, Jim Grigg, following a small Reception for Invited Guests, COUNCILLOR FREAK praised the work of the partnership in reaching their goal of re-opening despite many trials and tribulations and hoped that the community would respond by joining and taking advantage of the many facilities. Jim Grigg thanked Councillor Freak and the long serving County Councillor Maurice Nicholls for their efforts and mentioned all those involved over the past three years, in particular the Police who had helped considerably during the period when vandalism including window breakage and other damage was rife. 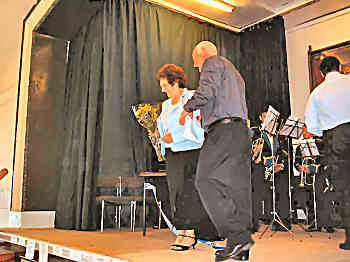 Pictured above are Councillor Freak and Jim Grigg, backed by the Trimdon Concert Brass, immediately after the ceremonial “Cutting” whilst a bouquet was presented. 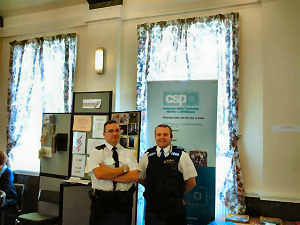 Also pictured below are P.C.Wayne Marston and PCSO Robbie Ramshaw who made the most of the afternoon by talking to many members of the community about their problems and the improvements which have taken place in policing and in the Neighbourhood Watch activities over recent months.